This Week's Issue: The F-35's Biggest Booster; Year-Round Events on Burlington's Waterfront? Burlington Mayor Miro Weinberger wants to hold more festivals and events, year-round, at Waterfront Park. But some neighbors object to more noise and park closures. 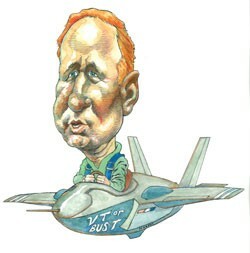 The quest to bring the F-35 to Vermont has drawn Frank Cioffi, the head of the Greater Burlington Industrial Corporation, out of the shadows.That's him in Marc Nadel's illustration, right. The University of Vermont is facing criticism from its own students and faculty for using kill traps to catch beavers in Centennial Woods. This week's WTF tackles a pair of questions from commuters: What's up with the sheet-enshrouded bridge in Richmond and the big foam blocks on the Burlington Beltline? In Fair Game: Vermont's laws, and its politicians, have a history of being gun-friendly. Will that change in the wake of the Newtown shootings? Also, one editor's note: the Seven Days office is closed through January 2 for our year-end break. We'll be putting out a double issue on December 26, with no paper on January 2. This blog will be updated less frequently than normal over the break, too. Happy holidays!